SUDBURY, ONTARIO – February 28, 2018 – Manitou Gold Inc. (TSXV: MTU) (the “Company” or “Manitou”) is pleased to announce receipt of assay results for the first four of the holes drilled during the winter drilling program at its Kenwest property, located approximately 50 km South of Dryden, Ontario. A total of 2,078 metres of drilling over 16 holes were completed. Detailed geological logging and sampling of the remaining drill core is still ongoing at time of publication. The first four drill holes were designed to test the Big Master (“BM”) #2 shear zone and confirm a new structural model for the mineralized zones. 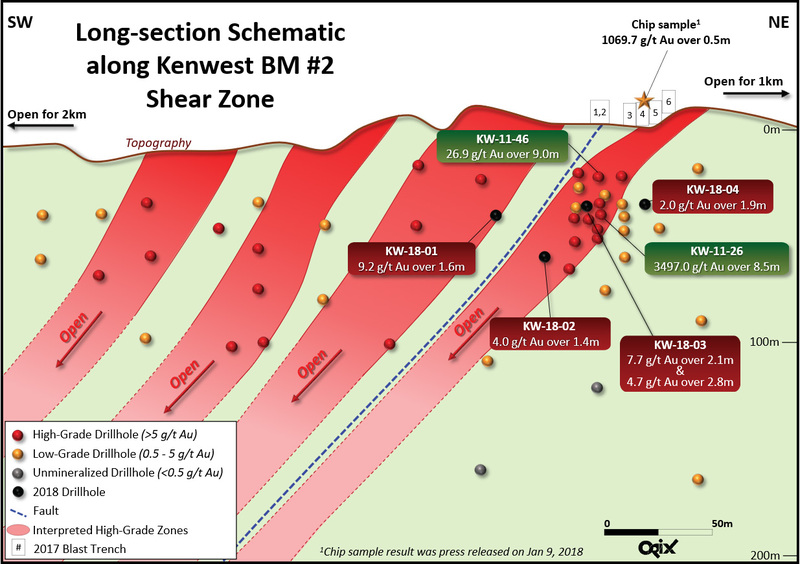 Twelve further holes tested the BM#1 shear zone in areas that were historically undrilled and had similar target characteristics to the newly identified structurally associated gold mineralization. Visible gold was observed in holes KW-18-03, KW-18-06, KW-18-09 and KW-18-10. Hole KW-18-01 encountered 9.2 g/t gold across 1.59 metres from 42.08 m to 43.67 m. Hole KW-18-02 cut 1.43 metres of vein material averaging 4.0 g/t gold from 68.87 m to 70.3 m. Hole KW-18-03 intersected two separate sections of mineralization, the first of which averaged 7.7 g/t gold over 2.1 meters from 43.0 m to 45.1 m, while the second section averaged 4.7 g/t gold over 2.81 meters from 50.29 m to 53.1 m. Hole KW-18-04 intersected 1.91 meters of mineralized vein averaging 2.0 g/t gold from 42.47 m to 44.38 m. The intersections described above were encountered at vertical depths of between 20 and 50 meters. True thicknesses are estimated at approximately 70% of reported core lengths. The BM#1 and BM#2 shear zones are subparallel, northeast to southwest trending shear zones that exhibit a near vertical dip and have been filled with quartz veining and related alteration. The BM#1 shear zone is located on the northwest side of the BM#2 shear zone. A plan map showing the area of the drilling on the BM#1 and BM#2 shear zones can be found on the Manitou Gold Website. An updated the long section illustrating these new results from the BM# 2 shear zone can also be found on the Manitou Gold Website.